Swatch pack of the Craft paper range; mini sheets (4 inch by 3 inch) of the Craft paper range, printed with the name of the paper on the back, so that you can check the colour, paper texture and appearance before you buy packs from the range. 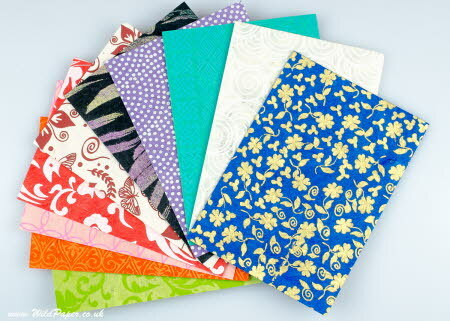 This pack contains 1 mini sheet each of the papers in the Craft paper range, approximately 10 sheets in all (a selection of colours are shown in the photo above). The Craft papers have a smooth calendared top surface and a slightly less smooth reverse surface. This is a natural product and the colours are approximate. They vary slightly between batches and may be displayed differently on different computer monitors.